While turnover tends to reduce in the weeks leading up to Christmas, when the New Year comes, itchy feet develop for many employees. So if you are hit with a sudden vacancy in the new year and you don’t have any employees that you can promote or transfer into the role, where do you go to find candidates? Ask your existing employees to help find people that will fit into the company culture and team. To help encourage referrals, you can pay your employees a finder’s fee on satisfactory completion of the probationary period by the new employee. Most businesses have websites, yet few have a careers or vacancy page. Think about adding in information about your business as a potential employer, list all vacancies on your site and encourage suitably qualified applicants to apply. Most people now look online for their new jobs. Check out the different job boards available in your country; compare the fees and whether or not there are listings for jobs like yours on them. This is one time that you want to see lots of similar jobs advertised, as it is likely there will be more candidates checking out the listings for work like yours. Also, look at specialist graduate online boards or university job boards and consider having a specialist employer page on the main boards describing the benefits of working for you as an employer. Sites such as LinkedIn are now becoming peak hunting grounds for higher skilled employees, but don’t discount the value of Twitter and Facebook to share the news of your vacancy with a wider audience. Smart businesses keep a file of unsolicited applications on file, and every 6 months or so, they touch base with the best candidates to keep details current, remind them about your business and advise them of vacancies. The old-fashioned print job vacant ad is not quite dead. For local vacancies, you can still find good candidates in the local press. If you are in a high traffic area, it doesn’t hurt to pop a sign in the window. This is not for CEO roles, but ideal for entry level or training positions. Think beyond the printed A4 sheet of paper, to a branded company board or electronic display. When there are no vacancies, you can use the board to promote company offerings and successes. If you are looking for recent graduates or career changers, then career fairs are a great way to develop a large applicant pool. While expensive, good agencies can tap into the hidden candidate market. They are great for hard-to-fill roles or more senior roles. Do your homework on the different agencies and their fees before placing your listing with them. Use the back of your brochures, business profiles, messages on hold or any other marketing collateral to encourage candidates to think about careers with your business. 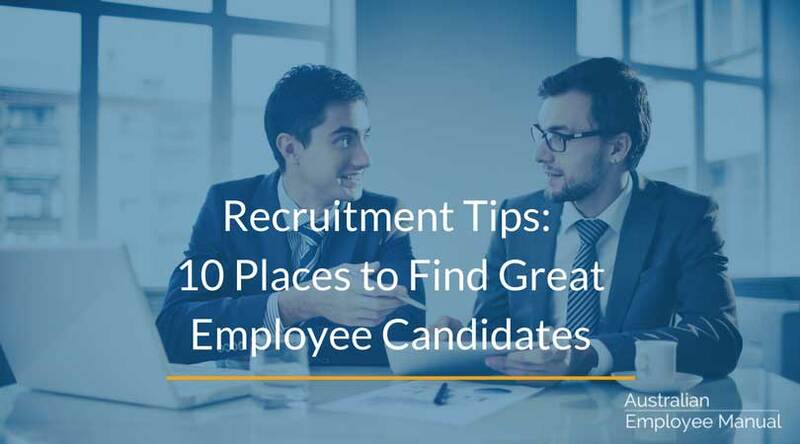 And a bonus place to find great candidates – your colleagues. This is not about poaching their existing staff, but simply asking colleagues at your local Chamber of Commerce, key suppliers and any referral partners if they can recommend a great candidate for your vacancy. Word-of-mouth referrals don’t have to be just limited to pure business! Remember that however you choose to advertise your job vacancy, you need to comply with all legal requirements relating to anti-discrimination and the Competition and Consumer Act. And just like anything in business, don’t put all your eggs in one basket. Use a number of strategies to help you create the largest possible applicant pool of great candidates. Remember, you are looking for the best person for the job, not just someone with a pulse.